On July 11, customers’ breakfast cravings will be satisfied with the new limited-time offer Double Choco Crumble Hotcakes. It’s the original golden brown Hotcakes that Filipinos have come to love, now topped with cookie crumble, drizzled with luscious chocolate-malt sauce, and served with maple-flavored syrup. With these delectable ingredients, Filipinos can continue enjoying a great breakfast experience that only McDonald’s can offer. 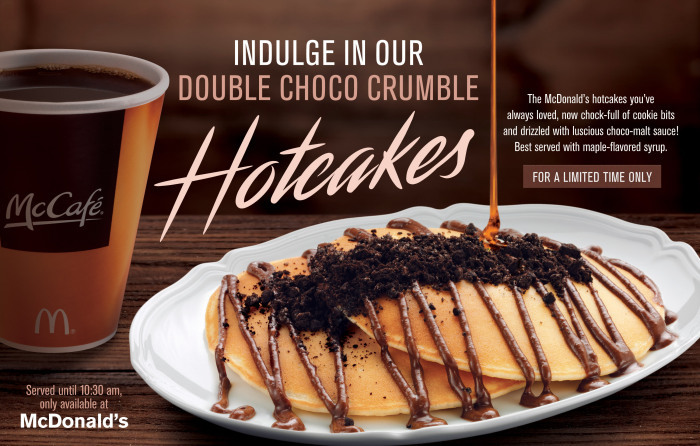 How irresistible was your morning with the all-new Double Choco Crumble Hotcakes? Share your breakfast experience on our Facebook page, http://www.facebook.com/McDo.ph, or tag @McDo_PH on Twitter or Instagram.